http://cgi.ebay.co.uk/KRYPTONICS-TRU...item33588c6645 are amazing too (you'd need two sets, obviously, if you bought the ones in this link). My boyfriend has them and I tried them out the other day - really comfy on rough ground and easily go over pebbles ... They're a bit wide (40mm), but that didn't bother me. I was also much faster than with the 62mm Kryptonics Routes I've been using recently. While 62mm wheels are okay outdoors, I'd recommend larger wheels for comfort and speed. and second I agree with Nellie on the Boomerangs, they are blooody great mate!! These are 70mm but the 65mm are also really good. "If I don't skate at least once a week I get annoying, so i'm told!!" I tried out my new Sure-Grip Motions today, and so far I'm not very impressed. They're so grippy or even sticky that at the beginning it was hard to do T-stops, and they make squeaky sounds on very smooth surfaces. They felt slower than the Kryptonics Trues and provided less cushioning on uneven ground. As these wheels are highly recommended on the French forum, I hope that they will improve with use. I've only just started skating outdoors, but after doing a lot of reading, went with the Krypto Route 65's (78A). They worked well. Did an 8km trail skate on a rough track - several changes in the track surfaces from asphalt to cement to some sort of paving. Lots of cracks and debris in some parts of the track, but the kryptos handled it all well. Last edited by Gero; April 27th, 2011 at 07:05 AM. I've heard wonders about the sugars from a friend of mine, she is so in love with hers she is almost getting married to those things. They were discontinued in the late 80s. So if you have a good opportunity to buy them for a reasonable price, - and you want them - you should jump at the chance. 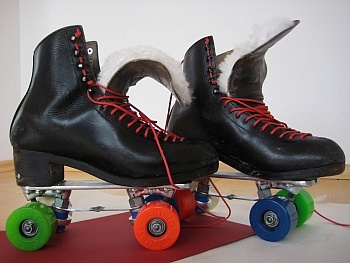 We can't really take all the reviews of outdoor (indoor too) wheels too seriously. Why? 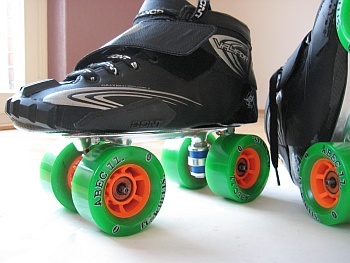 -- Because they are always based on comparisons with what other wheels a skater has skated. If the reviewer has never previously skated on any truly outstanding set of outdoor wheels, then what is their reference point for assessing the performance of a new set for them? When someone tells me how good a set of wheels rolls outdoors, I want to know what is the BEST previous set of wheels they rolled were. If those are actually not so hot wheels, then they might just be too easily impressed with the new ones and overly enthusiastic for them. Most of us veteran outdoor skaters here at SLF consider the discontinued 70mm Velocity Race wheels to be our reference wheel for what is the best performing outdoor quad wheel. Sadly, not every outdoor quad skating enthusiast has had or will have a chance to skate on these. However, my point is that unless you have experienced the really high performance truly primo wheels can give you, it is too easy to be impressed with not so good wheels, merely because they are better then the majority of crappy wheels that have the "outdoor" or "indoor/outdoor" marketing label slapped on them and have a duro reading that is on the 78A-89A range. Yes, it is good to know how people rate the mediocre and less than stellar wheels too, since at least we can still purchase (or avoid) these, but it is also helpful to state your previous best wheel experience for skating outdoors, to better qualify the opinion(s) you might offer. Why? 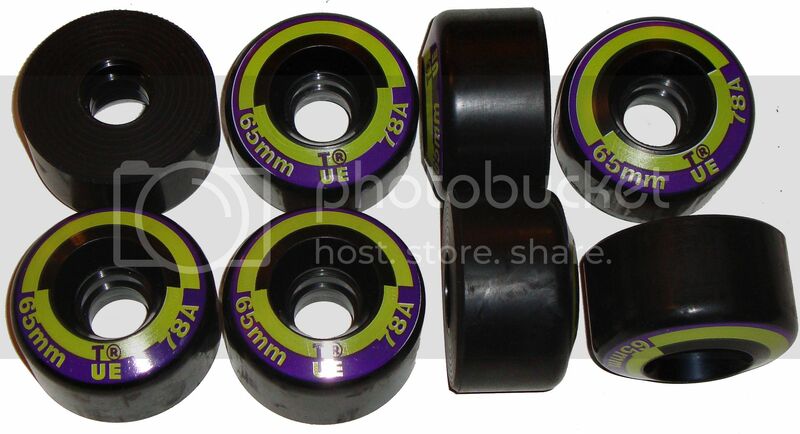 -- Because they are always based on comparisons with what other wheels a skater has skated. 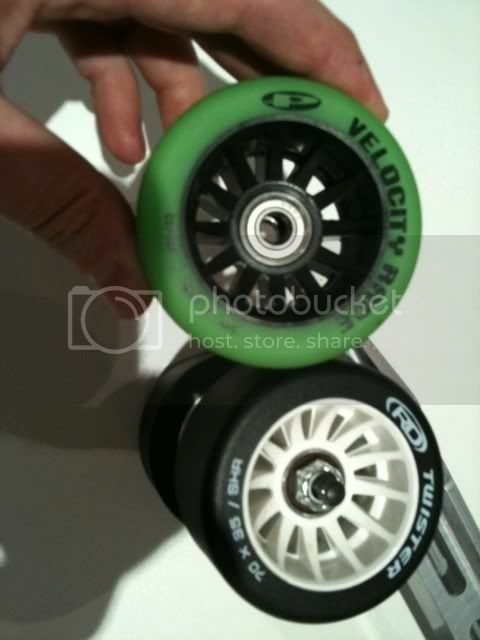 [...] 70mm Velocity Race wheels to be our reference wheel for what is the best performing outdoor quad wheel. Sadly, not every outdoor quad skating enthusiast has had or will have a chance to skate on these. The Velocity Race might be the ultimate reference, but they are gone. It is nearly impossible to find a set, used or NOS. So we should take a more realistic scenario as a reference. Or we must threatening a manufacturer with the use of armed force to offer a reasonable outdoor wheel - e.g. 70 mm diameter, 35 mm wiede, 80A-85A, large core, etc. I also would put Boomerangs second... but I have an OLLLLLD set of Kryptos, the harder sea-blue colored ones with "Krypto" actually imprinted in the side of the wheel, not painted on. Got them from a friend when I did the A2A and they skated just fine, but on the gator-back (the rough surfaced road) it was hell... but I don't know if ANY wheel could have made that section of road any better!!!! 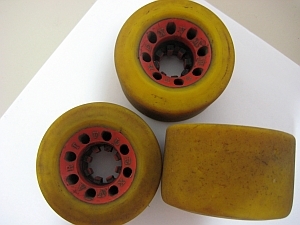 I had some Variflex outdoor wheels in the early `80`s that were awesome. 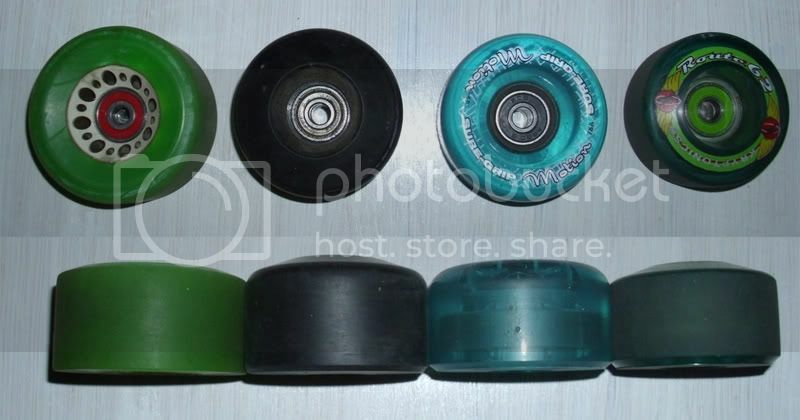 Now all I have are Hyper Rollo`s, Sure Grip Aerobics and some cheapos`s off ebay that are smooth as glass. Old school "Baby Kyrpto's" 57mm 78a red w/ black hubs "KYRPTOS" embedded in the wheel end x2. Used the have a set of green that were 57mm 90a ish? IIRC. The green were 92A, a still own a set of this wheels. The other colors were yellow 88A and white 96A. 65 mm diameter, ca. 85A.